Charleston Place finish on select hardwoods and veneers isseverely distressed with deep gouges, scribes, and rasping for an aged aesthetic. 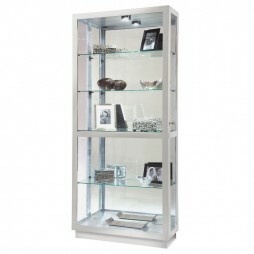 One adjustable glass shelf for two levels of display. 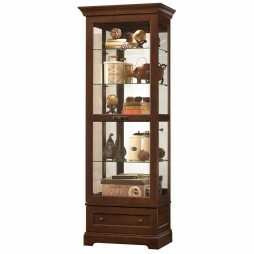 This curio cabinet features a drawer at the base of the casefor convenient storage. Beveled glass on door and glass mirrored back. 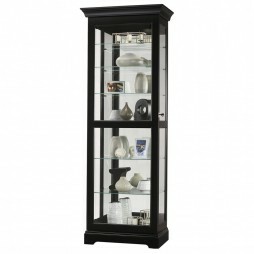 The front door of this display cabinet slides in both directions. 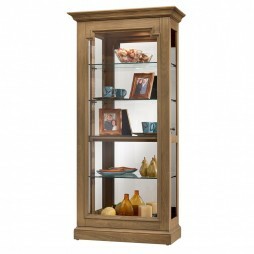 The front door of this display cabinet slides in both directionsfor easy access to the shelves. 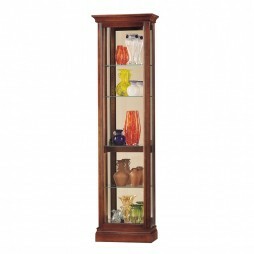 Large reeded columns feature decorative top corneroverlays. No Reach roller on/off light switch with halogen light islocated on the back and features a key holder. Aged Natural finish on select hardwoods and veneers is wirebrushed for a natural, reclaimed wood appearance. Adjustable levelers under each corner provide stability onuneven and carpeted floors. 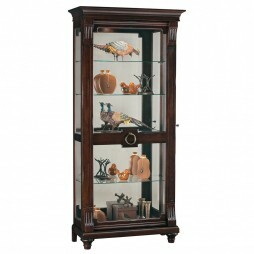 This curio console cabinet features side opening doors on leftand right side of cabinet. Hand-rubbed Gloss White finish on select hardwoods andveneers. With a quest for perfection, this Howard Miller Marsh Bay Curio Cabinet features a Driftwood finish on select hardwoods and veneers. 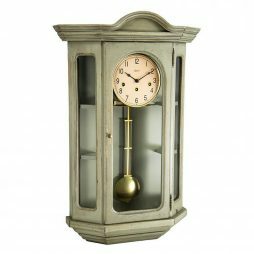 The finish is heavily wire brushed for a reclaimed, natural wood appearance. 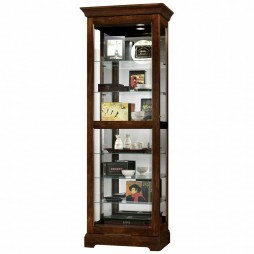 The locking front door slides in both directions to make it easy to place your collectibles and keep them safe. 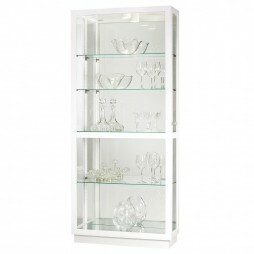 The cabinet uses halogen lighting to give you a whiter, brighter and longer lasting light to illuminate your items. The Pad-Lock™ cushioned metal shelf clips increase the safety and stability of the shelves. The mirrored back adds depth to the room and improves the view. 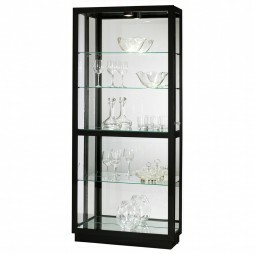 The four glass shelves are fully adjustable offering you the flexibility to display small and large items. 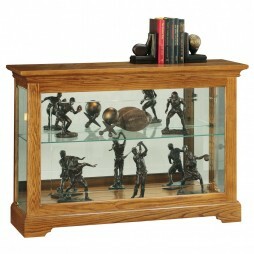 What a better way to display your collectibles than with a curio cabinet. 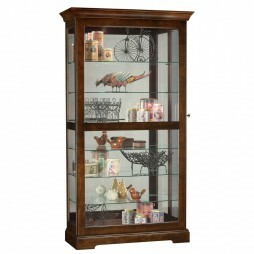 The four curved front glass doors set apart the Bradington Curio Display Cabinet. 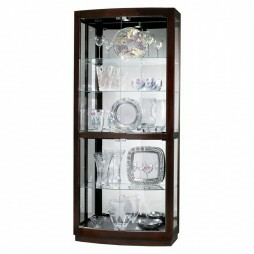 This traditional cabinet features adjustable glass shelves, halogen lighting with multiple settings, and a rich Black Coffee finish with nickel finished hardware. The glass mirrored back complements your collection and the PadLock cushioned shelf clips and adjustable corner levelers increase stability. 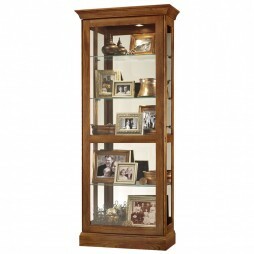 The elegant simplicity of the Williamson Curio Cabinet allows the beauty of your treasures to shine! 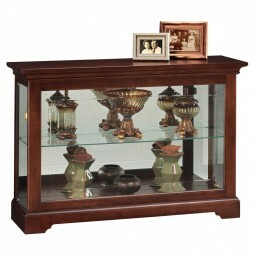 This piece is constructed from select hardwoods and veneers with a rich Espresso finish. The front door slides in both directions to allow easy access to your collection. 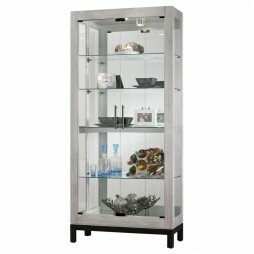 It also features a fully extendable drawer with an antique nickel finished pull for additional storage. 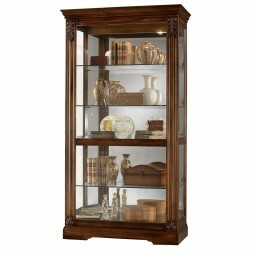 The unique grille design, decorative molding and nickel finished knob and back plate add to the beauty of the Roslyn Curio Cabinet. 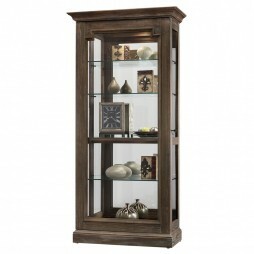 It is constructed from select hardwoods and veneers in a Worn Black finish with distressing. The locking front door slides in both directions to make access to your treasures easier. 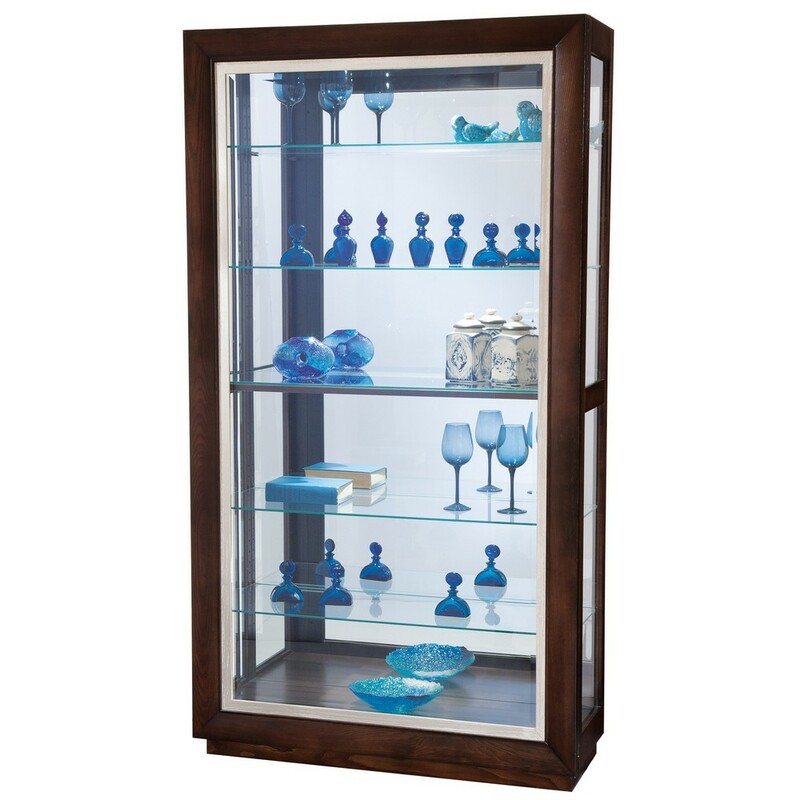 Your collection is further enhanced by the glass mirrored back and halogen lighting with roller on/off switch located on the cabinet back. The four adjustable glass shelves rest on PadLock cushioned metal slips for safety and adjustable corner levelers provide overall cabinet stability on uneven or carpeted floors. 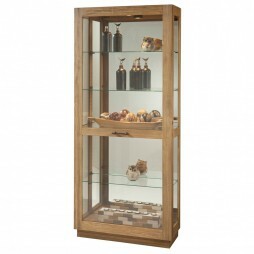 The Ramsdell Curio Display Cabinet is an extra wide and deep alternative to a traditional cabinet. 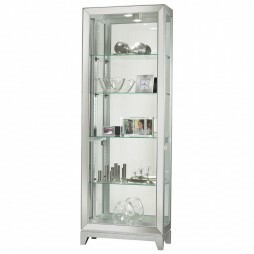 This elegant piece has many features including a locking, dual sliding front door, glass mirrored back, adjustable glass shelves for vertical display of plates and interior lighting with a NoReach light switch on the cabinet back. It even includes an interior power receptacle cord. 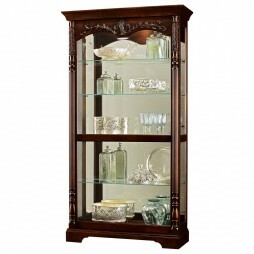 The cabinet is artfully styled from select hardwoods and veneers with Acanthus leaf column caps over a contoured column in a Tuscany Cherry finish. Beautiful! 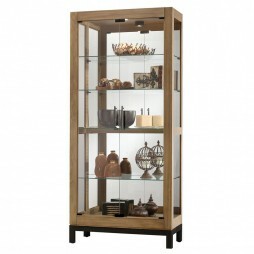 Simple and timeless, the Moorland Curio Display Cabinet is constructed from select hardwoods and veneers in a Legacy Oak finish. It features a locking, dual direction sliding front door. 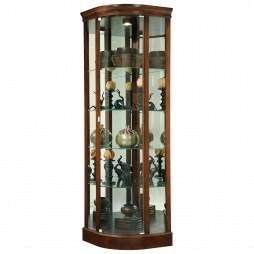 a mirrored back and seven levels of display for your collection. The adjustable glass shelves have plate grooves for vertical display and are supported by PadLock cushioned metal shelf clips for safety and security. You’ll find a NoReach light switch on the cabinet back to control your Halogen interior lighting. The adjustable corner levelers provide cabinet stability on uneven or carpeted flooring. A longstanding staple of the quintessential home, curio cabinets have served a purpose in highlighting favored possessions for decades. 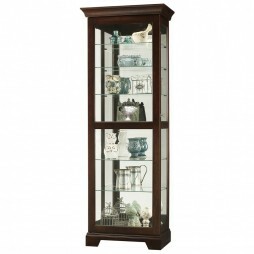 Anything from trophies to medals, from fine china to glass and porcelain figurines; curio cabinets are perfect for displaying items you’re proud to show off to all your friends and family. And thankfully, they can easily adapt to most any home decor style! 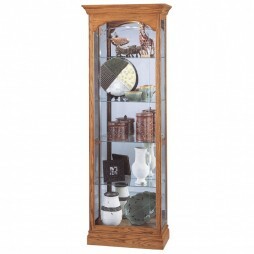 Constructed in different styles, colors, and shapes, every curio cabinet can make a lovely decorative piece in its own way. 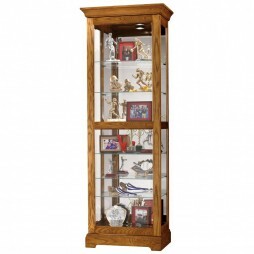 Our large collection of curio cabinets here at ClockShops.com comes from one of the most highly reputable and prestigious retailers in home furnishings: Howard Miller. 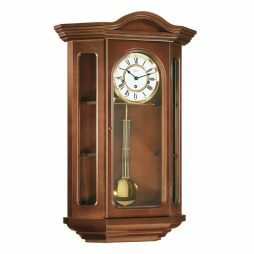 Designing everything from elegant clocks to high-end accessories, Howard Miller is a brand name you can trust to present reliable and beautiful products, each and every time. It’s time you shared your most beloved treasures with your loved ones. 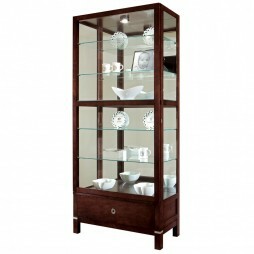 Invest in a curio cabinet today, and gift yourself with a lovely decorative furnishing to sparkle in your home for years to come. 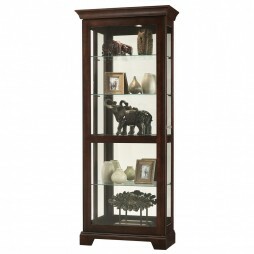 Fill an empty space in your home with the beauty and exquisite structure we call the curio cabinet. 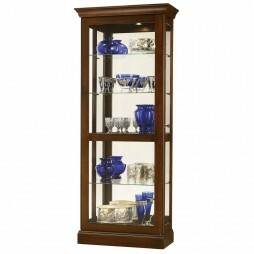 Generally built with strong hardwoods and glass panels, these display cabinets bring nothing but elegance and grace to all who purchase them. And while they may be known as a more traditional item, various models can certainly fit right in with modern home decor without question. 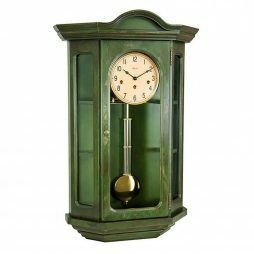 Upgrade your home with any of these fine curio cabinets from ClockShops.com, and find yourself entranced every time you wander by the valuables you put on display. 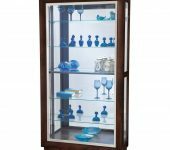 Some of the most classic designs are still on the market, demonstrated by examples like the Howard Miller Brenna Curio Cabinet or the Howard Miller Tyler Curio Cabinet. The tall, widely-set structures hardwood frames all come equipped with multiple glass shelving units for ample display and storage. They also have sliding doors that can slide in both directions, providing easy access to your beloved treasures so as to not potentially harm them. Furthermore, they’re designed with glass back panels to amplify your view of the valuables, and halogen lighting fixtures to emphasize your belongings with bright, long-lasting light. 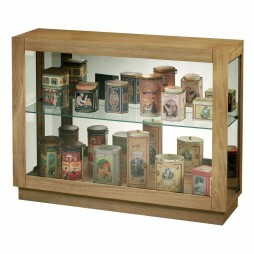 The shelves are adjustable as well, adaptable to fit larger or smaller possessions that you may want to display. Need a curio cabinet that’s not quite as wide, to fit in a smaller space in your home? 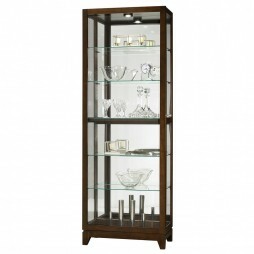 Other available models, like the Howard Miller Eve II Curio Display Cabinet or the Howard Miller Gregory Curio Cabinet, are slimmer and more discreet. They still allow for multiple shelving areas and plenty of surface area for displaying your treasures, but their smaller frames are convenient for nestling into smaller areas of the home. 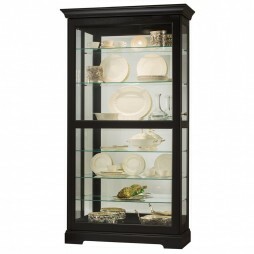 We even carry a few more decorative models to really enhance a bland space, like the Roslyn Curio Cabinet. 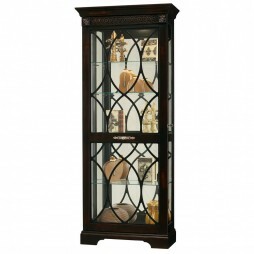 Equipped with all of the usual features of a curio cabinet, the unique grille design across the front doors just heightens this piece’s beauty. 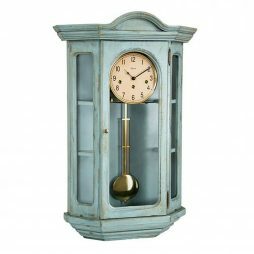 Both highly functional and elaborately decorated, you won’t find many options quite this exquisite. Or perhaps you’re searching for shorter models, if you have low ceilings or simply don’t want your cabinet to seem as though it’s towering? Well you’re in luck! 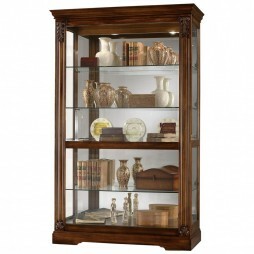 Howard Miller also has short curio cabinets, like the Burrows or Underhill Curio Cabinets. 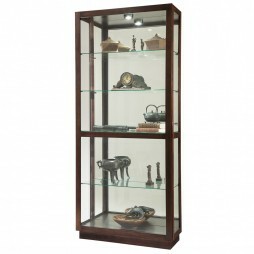 Reaching only a height of 33” inches, these display cabinets actually provide different storage options. 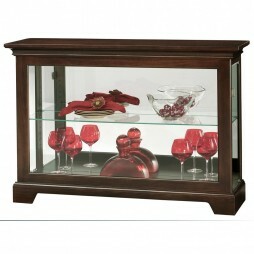 You can easily set these in a foyer or home office, able to show off your valuables. 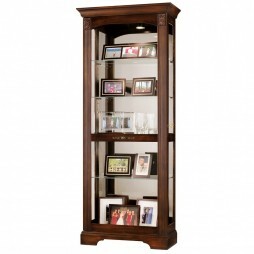 However, you can also use the top of the cabinet as added shelving space, perhaps for family picture frames or books. 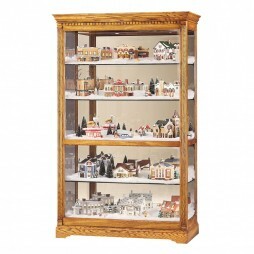 Any width, any length; we have any and all sizes of gorgeous curio cabinets available at Expressions of Time for your displaying needs!